Rae Lewis-Thornton: Diva Living with AIDS: Birthday Special For RLT Collection! 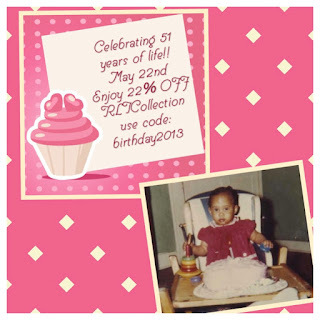 In honor of my Birthday today, May 22nd, I'm offering 22% off all RLT Collection Bracelets!!!! The Coupon Code is Birthday2013! The Sale will last who knows... :) But it will be around for at least a week! Thank you for all of your support! Shop Here!